Cons: The wide out has a thin frame and got the ball knocked out his hands by being out-physicalled against defensive backs on many occasions. He does not create much separation between himself and his coverage unless it is with his route running. On the line of scrimmage, Ford does not use his upper body to get away from the defender lined across from him and can tip-off the play call with his effort and route running. Ford’s concentration is suspect with too many drops. Even though the receiver makes difficult catches he’ll subsequently drop easier passes in the same game. The former Hokie has a bad habit of batting the ball up in the air with his hands and feet; this sometimes allows defenders to snag the pigskin for themselves instead of allowing a poorly thrown pass to drop incomplete. He traps some passes with his shoulder pads instead of catching them cleanly away from his body. His touchdown total and average yard per catch decreased from his sophomore year to his junior year and Ford is not much of a blocker in the running game. His NFL Combine performance also cause some concerns. 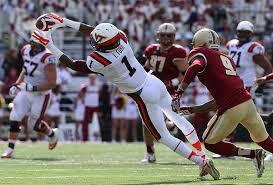 Pros: The best attributes the former Hokie possesses is his impressive catch radius and quick feet. He can sky-high for a pass, catching it at its highest point or dive low to snare a worm burner, all while contorting his body to make the difficult reception. Ford tracks the ball well in the air and can get under it to grab it without breaking stride. The wide out is dangerous in the open field, usually making the first man miss with his quick feet. This makes him effective in the screen game and on designed jet sweeps. The play maker usually lines up outside, but also gets sent in motion to find the best match up. He relies on his quick feet to get off the line of scrimmage when facing press coverage. Ford isn’t wary of grabbing passes in the middle of the field and does a good job getting behind the defense with double moves. The receiver fights for 50/50 balls and can make a bucket catch between two defenders in the end zone when necessary. He always knows where he is on the field, tip-toeing near the sidelines. Once the pigskin is in his hands, the former Virginia Tech follows his blockers while using stiff-arms and leg drive to gain more yardage. Overall impressions: Ford possesses the skills to become a starting NFL receiver, but I’m not convinced he will be a good fantasy player. The inconsistent hands, the lack of separation, and running hot/cold should drive his quarterback to look elsewhere until he gets more consistent. His effort and concentration must improve if he wants to make an impact on the team that drafts him. Chances are I will let someone else select him in my rookie drafts unless he falls into the beginning of the third round or later.